Just got this EP in the mail today and I couldn’t be happier. Excellent selection of remixes by some emerging South American talent. Soot records is the brainchild of New York Dj and producer Jace Clayton aka Dj /rupture. You can listen to his radio show called “Mudd Up!” on Wednesdays, 7-8p.m. on WFMU New Jersey/New York. And you can check him out on his blog Mudd Up! Looks like the Soot records label website isn’t up yet, but I highly anticipate any future releases. 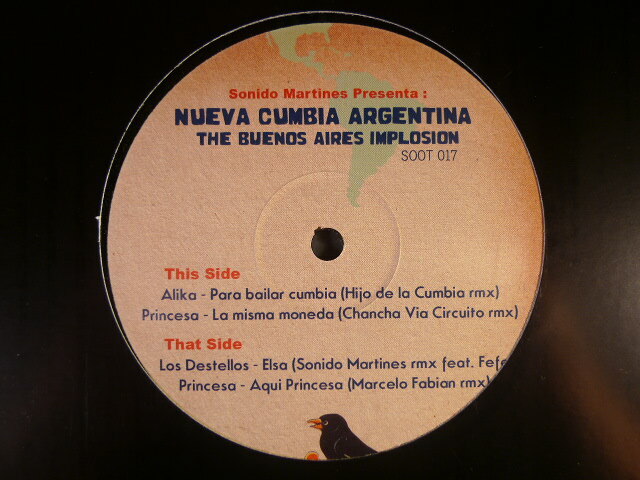 I couldn’t find out too much info on Princesa, but the other dj’s I’m familiar with via the Bersa Discos label. To be honest with you I’m not a huge fan of reggaetón, let alone this new school of cumbiaton (cumbia/reggaetón fusion). To me it’s really hit or miss. However, this Princesa track seems to really hit me where it counts. It reminds me of the more old school Reggae en Español popularized by Central American/Panamanian artists like Nando Boom and El General. This minimal Spanish dancehall, dem bow, Shabba Ranks influenced stuff is where it’s at. There is a sick Los Destellos rmx by Sonido Martines also, which happens to be one of my favorite cumbia/psyche groups out of 60’s/70’s Peru (I’ll do an article on them soon). Turntable Lab carries this joint and Juno in Europe. Highly recommended. word em ups adam. thanks for the kind words! Ever since ive heard this album I’ve been trying to locate info on princesa without luck, do you know anymore?